Due to popular demand, Mad Science are running Summer Camps these summer holidays for all 3 to 11 year olds! In Mad Science Camp, all mini mad scientists take part in hands-on scientific investigations, discover and explore a range of scientific concepts. 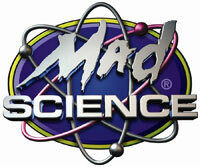 Mad Science will really spark their imaginations with this unique and innovative approach to science! Children can join us for anything from half a day to a full week.